After meeting during a European adventure and living a world apart, Ashley and Byron conquered the distance and found their happily ever after. Wanting to continue their journey, they enjoyed a colourful coastal celebration in Hawaii. After first crossing paths in Croatia on a European vacation, Ashley and Byron later found themselves in the same hostel in Barcelona. From there, a spark was ignited. With Byron living in England and Ashley in California, there was a desire for more adventures together. Byron came over to California and the couple later set off on an adventure through Asia. From here, they knew this was something special. When deciding on a wedding theme, there were some very different ideas. "Byron really wanted a neutral toned wedding but I am all about the bright colours. Can you tell who won the argument!" Ashley tells us. The couple settled on a bright and eclectic feeling with a touch of Hawaii thrown in. Colours focussed on warm tones with pinks, yellow and oranges featuring. To create a classic balance, gold and green details were trickled throughout the decor. The couple chose Hawaii as their destination as it created a central meeting point for family. Not only was the wedding a stunning day, but included a week of celebrations beforehand. Family and friends gathered for a snorkelling day, luau, spa day and brunch leading up to the big day. Catering to the warm climate of Hawaii, Ashley opted for a light weight and flowing design from Grace Loves Lace. "They had a bohemian relaxed collection that I knew would be perfect...My friend that was there chose it for me when I wasn't set on any of my five first choices. She made me try it on and I'm so happy she did". The gorgeous design featured a soft floral lace, front split, detailed high neck and fabulous bell sleeves. Complimenting the bohemian feel of the gown, Ashley's bouquet featured wildflowers, vibrant colours and Hawaiian natives for a truly tropical feel. Byron's bridal party consisted of his brother and two childhood friends. They each dressed in sharp navy suits and crisp white shirts. "They were supposed to wear black ties but one groomsmen forget his!!" Ashley tells us. Two bridesmaids and one man-of-honor joined Ashley each wearing tones and shapes picked by themselves. "They all have such different body types that I wanted them to feel comfortable in what they wore". This included a rich burgundy, beautiful peach and floral prints. Looking to create a truly relaxed and tropical feel, the couple added in a few personal touches. Outdoors games such as giant Jenga and a flamingo ring toss were set up overlooking the ocean. Large lettering spelt out Aloha to the guests and created a festive neon glow later in the evening. The reception decor focussed on natural tones with white linens, green goblets and gold cutlery all featuring. Cocktail canapés continued to follow the coastal theme with tropical fruit skewers drizzled with honey and dusted with coconut shavings. A sit down meal followed with a decadent filet mignon and grilled ono. In honour of Byron's american relatives, the couple created a s'more bar in the evening. What followed was a chance for guests to dance the night away, capture fabulous photo booth shots and celebrate with the happy couple. 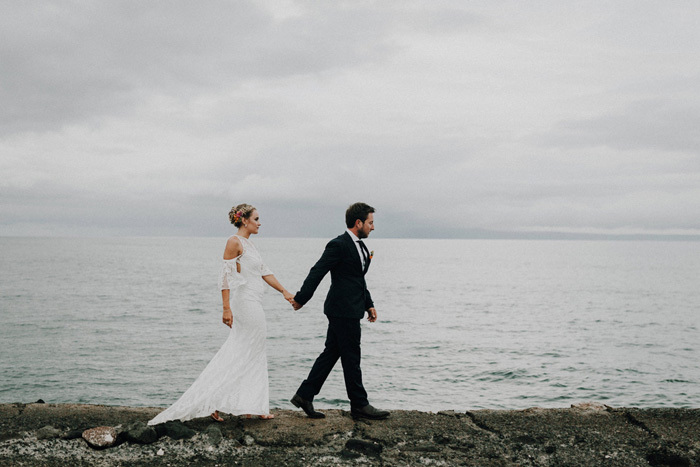 Taking a break from the chaos of the day, the couple strolled along an ocean facing rock wall to capture some romantic moments. Ashley recalls "It was really nice to be away from everyone for a bit so we could take it all in and just enjoy being in the presence of one another." This wonderful couple wanted each of their guests to take away a touch of tropical paradise with them. Ashley tells us "My dad has all sorts of crazy hobbies. One of them is soap making! He made all of our guests coconut and pineapple scented soaps". Stay organised! A wedding diary is a great idea. While getting ready, crank the tunes, pop the bubbly and have a bite to eat.